We're looking for a poured-in-place playground surface that will last as long as possible. Surface America's top surface, a granule and urethane mix, includes an industry-leading 2.44 pounds of material per square foot, yielding a dense, tight 1/2-inch nominal thickness. Many other systems use 10 percent to 40 percent less material in their top surface. More material means more structural integrity and a longer life. We're concerned about our indoor and outdoor surfaces getting slippery. Musson Grit-Strip Safety Surfacing is a tough mineral-coated waterproof nonslip surface with a pressure-sensitive adhesive back. It helps grip foot traffic and prevent slipping. The easy-to-apply surfacing comes in rectangular sizes with rounded corners, 1/32-inch thick or in rolls cut to any length. It makes an effective solution for any high-traffic area, especially stairs, where safety is a primary concern. Colors include gray, brown, beige, safety yellow and bright red. We are looking for accessible tables that are fully useable by everyone. The new accessible park table from R.J. Thomas Mfg. Co. Inc. marks an innovative design evolution of the company's other tables. The table is accessible to wheelchairs at both ends. In addition, full-length seats offer full-capacity seating when wheelchairs are not in place, offering an advantage over extended-top tables. These portable tables can be 6, 8, 10 or 12 feet long. They meet or exceed current ADA guidelines. Top and seat materials include lumber, recycled plastic, aluminum and vinyl-coated steel. The high cost of materials such as hardwood and high-priced installation and maintenance are concerns as we consider a gym and aerobics floor for our fitness facility. Loncourt UV offers a real-wood look, glossy fitness surface that meets all NCAA bounce requirements. It's effective for gymnasium, aerobics and dance, martial arts, and other high-impact fitness facilities. Loncourt UV's tough, UV-cured, low-maintenance urethane finish cleans up like dry-erase magic. Loncourt UV offers superior sport performance. Moving portable staging makes us feel like the circus is coming to town. We use extra manpower, get strained muscles and backs, jammed fingers, and skinned knuckles. Besides that, if it rains overnight, the wood part of the stage gets damaged. Southern Aluminum AluLiteTM Portable Stages are lightweight, strong, durable and affordable. They assemble quickly with only two people needed to connect deck sections. The all-aluminum staging can fit any venue, large or small, indoors or out. Children are playing on our aquatic lift when it's not being used. 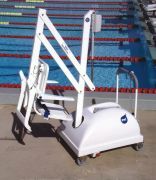 The PAL (Portable Aquatic Lift) is a completely portable lift that can be stored out of the way when it's not being used but then easily positioned for use when it's needed. The seat on the lift can be reversed to make it easier to store, while removing the temptation to use the lift as a jungle gym. The PAL is an effective accessibility solution for busy, mixed-use facilities. We would like an attractive gazebo that will withstand inclement weather. Vixen Hill gazebos and bandstands are artistically balanced and skillfully constructed of the finest materials available. The pre-engineered aspects of the products eliminate guesswork and provide easy installation at any point of development. Regardless of your contractor, you are sure to get lasting product integrity. We need a way to verify flow rates in our commercial pool, spa and waterpark attractions. Digi-Flo® F-1000 meters provide the performance and accuracy required for commercial pool and waterpark attraction managers to easily verify that their system is pushing the optimum amount of water. Three versions are offered: the F-1000RB rate meter, F-1000TB flow totalizer, and F-1000RT rate meter and flow totalizer together. Sizes are up to 12-inch pipes. The low-maintenance system operates on two AAA batteries and has an LCD display. It's factory calibrated, with nothing to program. It has a water-resistant enclosure, corrosion-resistant sensor and large flow range.